We just celebrated Avi’s 3rd birthday and kept it relatively simple. We invited a few kids over, ordered some pizza, passed around apple juice boxes, and ate cake that has a Peppa Pig as its decoration. It was good. It was super basic. And it was perfect. Also, I made these cookies. This does not make me original, because everyone (and I mean everyone) has made these cookies. Otherwise known as “the cookies that broke the internet” or “the cookies blogged around the world”, these may become (if not already) some of the most talked about cookies at least in the digital realm. Initially, I wasn’t going to write about them, but then I ran into a little trouble when making them for the first time, namely, I slightly overmixed the dough and my cookies spread paper-thin when baked. 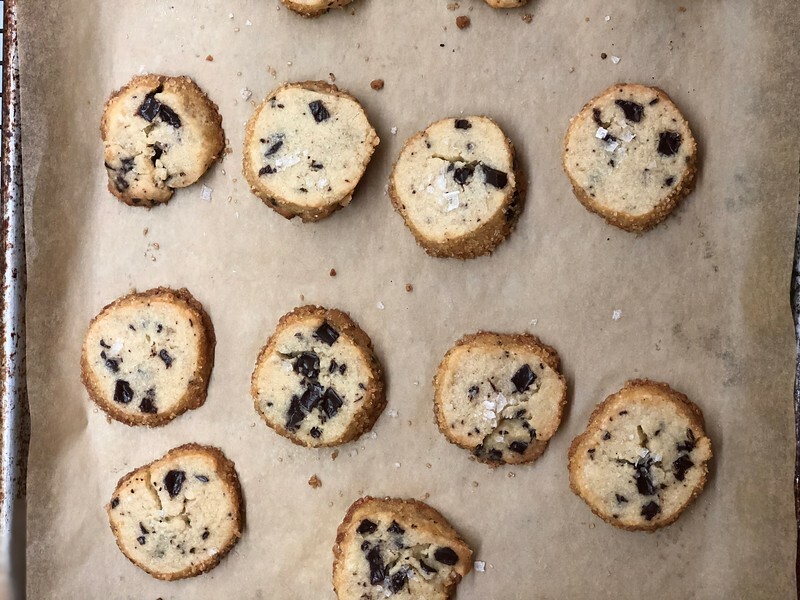 When I reached out to Alison, deeply ashamed that I might be the only person who failed at these cookies (everyone’s Instagram cookies looked PERFECT), it turned out, through our exchange, that her cup of flour weight differed from mine by about twenty grams. I immediately made them again. This time, I ran into a great deal more luck, but I still found the dough to be a little unruly to work with (it proved a bit finicky when I was slicing it), and figured that if I had to work with it a little, maybe others might find some of my discoveries and tips useful. So, here we are. There are no eggs in this cookie dough (it is a shortbread, after all), so you can eat the cookie batter straight out of the bowl without worrying about raw egg issues. Normally, my default weight for 1 cup of all-purpose flour is 125 grams, however, in my exchange with Alison, she mentioned that she tested the cookies using the scoop-and-sweep method popular in the US, which meant that her cup of flour was about 140 to 145 grams. While I kept her imperial measures the same below, the gram equivalent in the recipe reflects the scoop-and-sweep method of measuring. I also decreased amount of chocolate by about half; judge me all you want, but I prefer my cookies light on the chocolate. I buy higher-fat European butter for my cookies, and it conveniently comes in 250 gram packages, which is just 5 grams shy of what the required amount needs to be below. I found the cookie logs a bit messy to slice; giving them a little time on your counter, to soften, remedies this problem. I found no difference between using a serrated vs non-serrated knife. So long as the knife has some heft to it, you should be okay. Lastly, for friends across the pond, I’ve included UK terms where appropriate in parentheses. Using an electric mixer and a large bowl or a stand mixer fitted with the paddle attachment, beat the butter, both sugars, and vanilla on medium-high speed until light and fluffy, 3 to 5 minutes. Stop the mixer motor, and using a spatula, scrape down the sides of the bowl. With the mixer on low speed, slowly add the flour, followed by the chocolate chunks, and mix just to combine. The mixture will look crumbly. When ready to bake, preheat the oven to 350°F (~175°C). Line 2 baking sheets with parchment paper. Beat the egg. Unwrap your cookie logs, and if the dough feels quite hard, give it about 10 minutes to soften. With the plastic wrap open, brush the outside of the logs with the beaten egg. Roll them in the coarse sugar (this will give you those delicious, crispy edges). Using a large, heavy knifes, slice each log into ½-inch (1.25 cm) thick rounds, and place them on the baking sheets about 1 inch (2.5 cm) apart. (I have found no difference in serrated vs non-serrated, but the cookie logs might be messy to slide and may break in pieces. If this happens, patch the broken cookies together, and press the dough log down to compress further, giving it a few more minutes to soften. When the cookies bake, the patched slices will be pretty forgiving!) Sprinkle the cookies with flaky sea salt and bake 12 to 15 minutes, until the edges are just beginning to brown. Transfer to a cooling rack and let cool slightly before eating. Thanks for all the tips! Wonderful! OMG, is that a unicorn? A triple rainbow? The Loch Ness Monster? Nooooo! It’s a US food blogger who realizes the rest of the world works in metric! Bugger the cookies, I signed up purely because of that. Chris – your comment made me giggle! I hope you make (and enjoy) that cookies. Actually, to be fair, there are a number of bloggers (I’m kind of just a food writer with a blog – i.e. I made $0 on my blog since I don’t run ads) who are bigtime bloggers who use grams. Deb Perelman of Smitten Kitchen is one; and there are others, too. THANK YOU – for the weight information! I have definitely joined the weigh vs. measure camp when it comes to baking. Just made my second batch, having measured on the first one as it was before your post, and these came together much easier. Lisa – I’m so glad that the second batch came together easier! Happy eating! Could you post your chicken soup recipe? I am in the market for a new one! I’m so sad! Just made these, used Alison’s flour weight, and they spread like a whore in a brothel. They were packed tight when I rolled them, I refrigerated X 2 days (couldn’t get to them after 2 hours). I did let them chill a bit before cutting as I’ve done with Dorie’s shortbreads, but no dice. I only made one roll, so plan to slice the next roll more chilled and then pop into fridge or freezer before baking, but what a disappointment! Nonetheless, nice to see you back here in the ether. Gayle – I had the same problem the first time around. I’m wondering if you overcreamed the butter, which is what this sounds like. Did you follow her recipe from the book or my updated instructions? A warm thank you from Switzerland!